"Please don't make me jump!" Watching your sweet pup struggle to get up the stairs or climb in your car isn't fun, but picking up a heavy dog can be dangerous for both of you. Building an outdoor pet ramp lets her retain her independence while you keep back pain at bay. 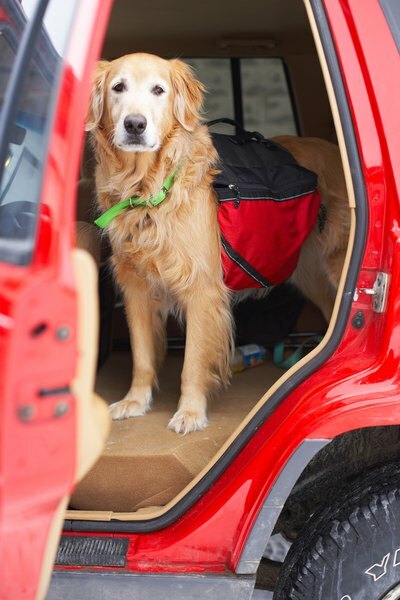 Pet ramps are handy when your pooch has trouble climbing the stairs to your front door because of size -- for tiny doggies -- injury or arthritis, or if she can't jump high enough to get in your vehicle. They can also help your dog if she has trouble jumping down from your car. They work well for low heights, such as 2 feet. If you have a long staircase to your front door, a ramp is not likely to be an option -- it would need to be so long to keep the angle shallow that your yard may not have room. To build a pet ramp, you need some two-by-fours and plywood. Cut two short legs and two longer ones out of the two-by-fours, mitering the top to match the ramp's angle. Building a rectangle hollow box out of the two-by-fours helps shape the ramp and support the plywood. Add some center supports if necessary for longer ramps or heavier dogs. After you nail the plywood to the top of the box, you can add the short legs to the bottom of the ramp and the long legs to the top. The bottom of the plywood should rest on or near the ground, but putting legs on each side provides additional stability so the ramp won't scoot when your pooch climbs on it. Small dogs need ramps at least 12 inches wide and big dogs need at least 16 inches. The tricky part about building the ramp is finding the right angle. Your angle determines how long the ramp should be. Measure the height you need to reach the top of your porch or into your car. Stretching out a measuring tape from the highest point to the ground can help you see the angle of the ramp; an angle tool can help find an exact measurement. Some basic guidelines are steeper slopes for young or middle-aged healthy dogs, a milder slope for older dogs and a gentle slope for arthritic or injured dogs. A steep slope would be 26 degrees. If you need a final height of 24 inches, the ramp must be 54 inches long to make a 26-degree slope. For a milder 22-degree slope, the ramp should be 64 inches, and a gentle 18-degree slope needs a 74-inch ramp. Although painting the ramp is an easy way to finish it, paint can be slick when it gets wet from rain or dew outside. Instead, cover the plywood with outdoor carpet to create a non-slip surface for your pup. Painting the legs and sides if you feel artistic. Pet Classics: Which Indoor Ramp is Best for My Pet?